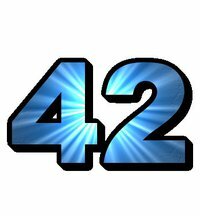 Damon Lord: Come along to the 42nd "42" Worcester! Come along to the 42nd "42" Worcester! On the 28th of January 2015, we celebrate the 42nd occurence of the genre fiction event 42 Worcester, and I'll be performing! 42 is one of the best spoken word events in the world, and is the longest continuously running spoken word event in Worcestershire, encompassing performance, poetry and prose. It's focused on genre pieces, encompassing Gothic, science fiction, fantasy, and beyond. It was the first event I performed at, and I am proud to say that it is the spoken word venue that I truly consider home. It's been an interesting journey through the years since it started in March 2011, and has changed hands a few times, beginning with shining lights Glenn and Angela James, who started it all, then with the wonderful John Taylor, and is currently being helmed by the talented Andrew Owens and Polly Robinson. We have also changed location a few times, starting in the cellar of the Worcester Arts Centre, then to a local cafe (with a unfortunately memorable noisy fridge! ), then to the friendly Lunar Bar in New Street, before finally outgrowing the venue and going downstairs to the much larger welcoming Drummonds in New Street. All the way through, quality has been consistently high (apart from the puppets, which was... interesting...). It's probably one of the best nights out in Worcester, and I'll be performing there! I sincerely hope to see you all there on 28th, when doors open at 7pm, starting at 7:30pm, at Drummonds, New Street, Worcester!